As decline in local industry burdened the Town of West Jefferson with unemployment and disinvestment, community members determined to revitalize and reimagine the character of their downtown. Outdated and ineffective street elements, including poor lighting, faded or unmarked crosswalks, and unsightly overhead utility lines, were damaging the area’s ‘curb appeal’ and stifling potential commercial investment. Additionally, high traffic speeds through the Town’s central business district created hazardous conditions for pedestrians, making walking in the downtown a difficult and dangerous proposition. Through a partnership of local leaders and NCDOT staff, a routine resurfacing of Jefferson Avenue (NC-194/US 221 BUS) was leveraged to transform downtown West Jefferson through the removal of traffic signals at two intersections and incorporation of pedestrian-friendly streetscape elements to attract new businesses to downtown. Developed around a train depot in the early 1900s, West Jefferson’s streets were built to accommodate its heavy industrial traffic. Furniture, agriculture, and textile industries sustained West Jefferson, as well as a dairy processing plant which stands today as home to Ashe County Cheese, the only major commercial cheese production facility in the state. Vehicle traffic from one industry in particular—a furniture manufacturer—arrived each morning and left each evening at the same time. Traffic signals were installed at two key intersections along Jefferson Avenue to provide efficient and safe flow of this traffic. However, in the latter part of the 20th century major manufacturing companies relocated outside the downtown area and over time the associated traffic, employees, and spinoff business left with them, resulting in the decline of downtown. While the traffic that necessitated the traffic signals was gone, the traffic signals themselves remained. Jefferson Avenue is a 60-foot wide, two-lane undivided road that frames West Jefferson’s cultural and historic downtown core. Diagonal on-street parking lends a sense of enclosure to downtown, and most locals ignore crosswalk striping as they run errands, crisscrossing the street lined with art galleries, hair salons, and restaurants. Designed for large trucks, wide curb radii lengthen the distance pedestrians must walk to navigate the three-lane signalized intersections, making crossing the street a challenge. In the 1970s, followers of acclaimed fresco artist Ben Long sparked an interest in regional tourism in West Jefferson, and since then other artists have relocated to participate in the close-knit art community. Art galleries have attracted more visitors each year, while growing events like the Town’s annual “Christmas in July” festival underscore the area’s popularity as a tourist destination. In 2003, the Town hosted students from North Carolina State University’s College of Design, Department of Landscape Architecture for a design charrette. Underground relocation of overhead utilities, decorative textured crosswalks, and vibrant landscape elements were among students’ recommendations, with conceptual designs visualizing a more pedestrian-friendly downtown. The 2010 West Jefferson Pedestrian Plan further defined the community’s vision for a revitalized downtown. Building on concepts from the 2003 design charrette, the plan included specific recommendations for an enhanced pedestrian experience, and reinforced the Town’s commitment to making the changes necessary to make the vision a reality. The plan’s funding was awarded by NCDOT as part of a competitive grant process, and NCDOT officials provided review of the document and insight regarding barriers to implementation. In summer 2011, NCDOT announced plans for a routine resurfacing and drainage improvement project along Jefferson Avenue. 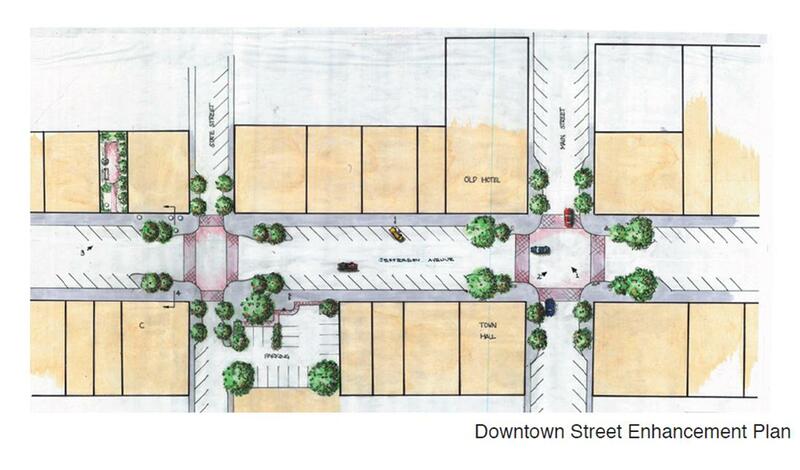 Seeing an opportunity to leverage the resurfacing project for greater things, Town leaders asked what streetscape elements could be included as part of the project. Unfortunately, a contract for the original scope of construction had already been awarded; the project’s start date was only weeks away, and the Town and NCDOT had few options available to them. What happened next, recalls Division 11 Senior Planning Engineer Dean Ledbetter, was “a good conversation” between NCDOT and the Town that became the basis for the project. Once communication began, the Town and NCDOT realized they had overlapping interests and that the project could be mutually beneficial. Jefferson Avenue’s traffic woes stemmed from the traffic signals at either end of the corridor. “Motorists familiar with the signal timing [along Jefferson Avenue] would accelerate to avoid getting stuck at the light, and as a result the downtown section posed a hazard for those crossing the street,” Ledbetter explains. Within months, the Town laid out construction plans with funding from the Appalachian District Health Department. NCDOT funded a $208,000 small construction project for roadway improvements in exchange for the removal of the traffic signals, and the Town contributed $140,000 for sidewalk and streetscape improvements. Brick pavers, underground utilities, and landscaping were incorporated over the next two summers at an overall project cost of $379,000. Removal of the two 4-way traffic signals will save NCDOT an additional $1,500 per year. While NCDOT engineers were not surprised by the project’s traffic calming effects, the economic benefits have been astounding. Since the traffic signals have been removed, the number of vacant storefronts and apartments in the downtown area has dropped from thirty-three to five. Business owners have noticed that the project reduced traffic speeds along Jefferson Avenue, and residents report feeling safer crossing the roadway. “We have seen an impact here, I think mainly due to the slowing of traffic coming through Jefferson Avenue. It slows them down, they’re forced to stop at the intersection directly above us. And it causes them to look around,” reports Josh Williams, owner of Ashe County Cheese. 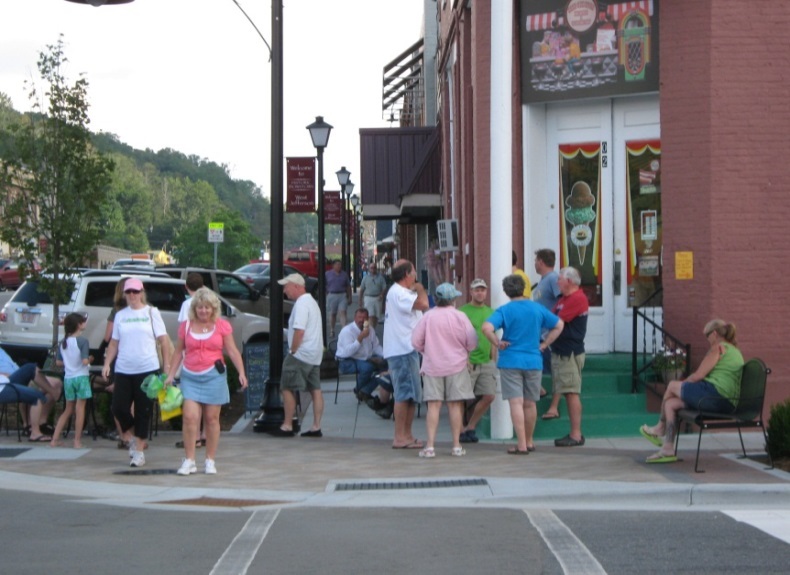 West Jefferson’s story has become a model for other small towns; NCDOT has featured the project in a public relations video and print publications by the Ashe County Chamber of Commerce and the Carolina Planning Journal have also showcased Jefferson Avenue’s transformation. Leaders from counties and towns nearby have since expressed similar desires to have their traffic signals removed, and as of July 2014 NCDOT Division 11 representatives have taken down nine signals, with plans underway to remove at least seven more. Not only do the streetscape improvements enhance pedestrian safety at these intersections, but the division-wide changes stemming from West Jefferson’s Streetscape improvements will result in a modest $13,800 in yearly division savings in maintenance costs alone. Ledbetter, D. (2014, July 8). Discussion of West Jefferson Streetscape Project. Ledbetter, D. and Blackburn, L. (2014). 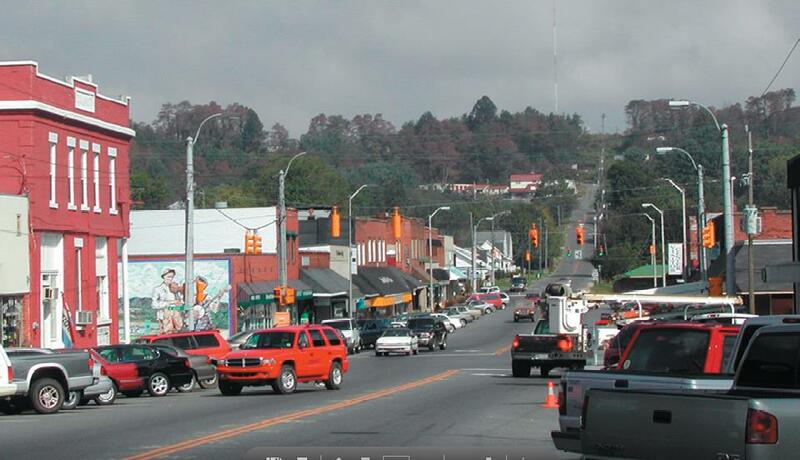 Simple changes and collaboration: ncdot and the town of west Jefferson partner to revitalize downtown. Carolina Planning Journal, Volume 39: 49-51. NCDOT. (2014, January). CS Training and Implementation in North Carolina. North Carolina Main Street Conference. Accessed from: http://www.ncmainstreetcenter.com/wp-content/uploads/2014/04/Main-Streets-Complete-Streets-presentation-January-2014_lbedits.pdf. NCDOTcommunications. (2013, September 30). West Jefferson Streetscape Project. Retrieved from https://www.youtube.com/watch?v=7t1Iuy2QVGk. NCDOT Division 11 Senior Leadership Team. (2013, September 3). West Jefferson Presentation.